From whatever place in central Europe we may start our tour, we can reach the city of Salzburg comfortably via excellent highway connections. Once arrived, we start our day with a driven city sightseeing tour - depending on the actual group size either by full size bus, minibus or car. This way, you get a first impression of Salzburg quickly and we save a lot of time later on. After a short lunch break, you will meet your local Salzburg tourguide who takes you to a guided city walk in English through the city of Salzburg. On your way, you will see famous tourist attractions like Mirabell castle, the residence of the Mozart family, the Trinity church and the Salzburg cathedral. 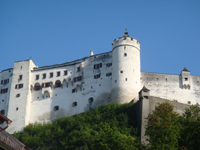 Before returning to where we came from, you have some free time for shopping in Salzburg or to visit the huge medieval fortress of Hohensalzburg and / or the Mozart birthplace museum.